1977 to 1980 were the peak years of my photographic activity, and this page gives me an opportunity to show a single image, taken 25 years ago this month. Images will change every month, and will not appear elsewhere on the site - although the train or working may do so. A summer Saturday in August 1978 (the Glorious 12th! ), and despite the large number of holiday trains passing towards Llandudno, Llandudno Junction shed is quiet. Seen here are 24023, a class 25 and 47436. 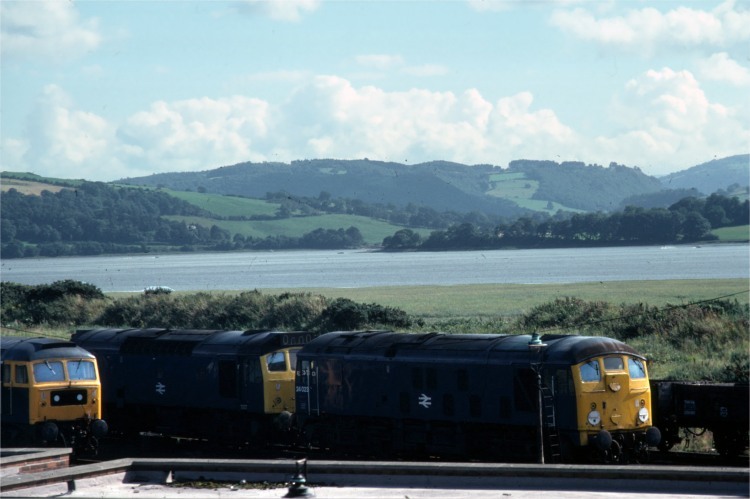 This photo was taken from the end window of the footbridge at Llandudno Junction - the first place to go to see what was on the depot. Today, 25 years later the view couldn't be more different, and the equivalent 2003 shot would include sights of commercial or motoring interest, but not one single railway related artifact. This shot shows how exposed the depot sidings were to a wind blowing in off the tidal marshes of the River Conwy. At one time glass screens were used to protect the southernmost platform of the station.